My husband and I, just like any couple, enjoyed several years of togetherness as boyfriend and girlfriend, seven, in fact, before taking the plunge. We had two ideas in mind: one was pretty crazy at the time, and the other was the sensible, socially expected one. In matters like weddings, people are risk averse and at first, we were no different and went down the usual path of a traditional wedding. After a while though, the planning and decision making felt meaningless. 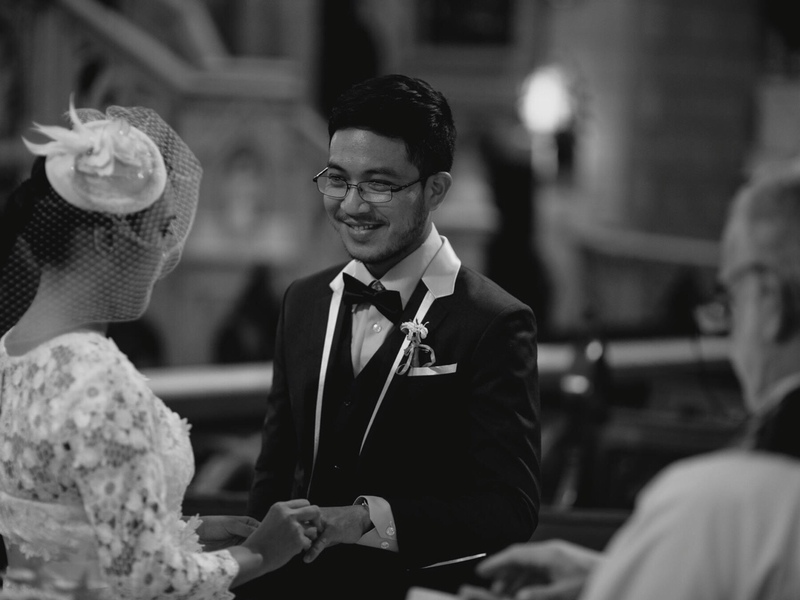 Getting married felt like it was less about us and more about pleasing the people around us and coming up with the kind of wedding appropriate to our social standing, people’s perceptions of our (non-existent) wealth, etc. Of course, a wedding like that would certainly blow a hole in your wallet but the idea of spending so much on just one day sounded crazier than our idea to get married abroad. 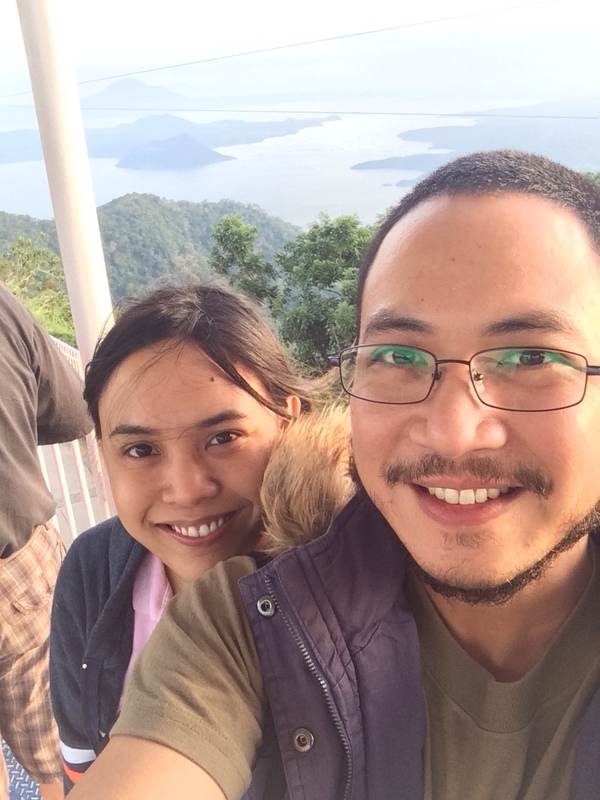 We both love to travel and the idea of getting married in a faraway country sounded far more exciting and romantic than just getting married in the Philippines. 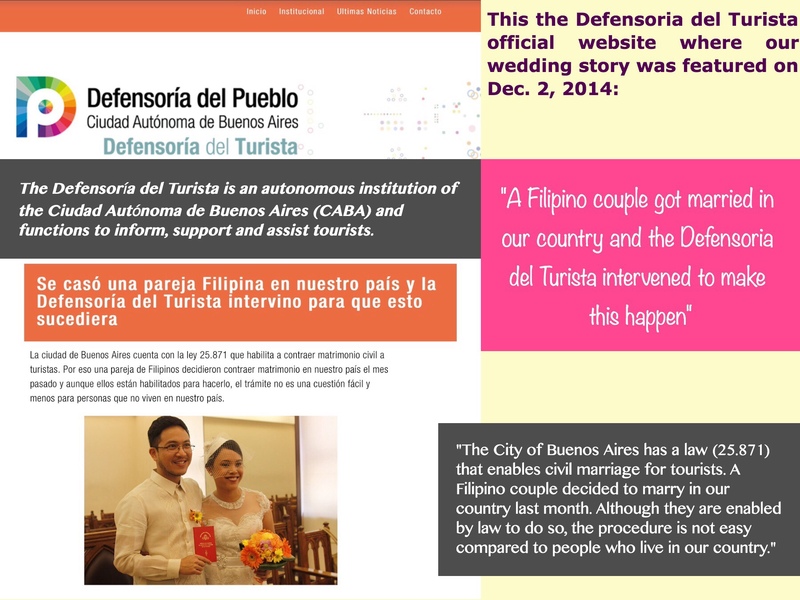 Getting married overseas is not new to us. Our own parents got married overseas – mine in London, United Kingdom and my husband’s in New Jersey, USA where they were working at the time. Two of our siblings got married overseas. What made our idea crazy was that we wanted to do it in a foreign country as tourists without knowing anybody there. Most of our research we did online, tracking blogs, sending emails, etc. but it was hard to find a country that fit our needs. 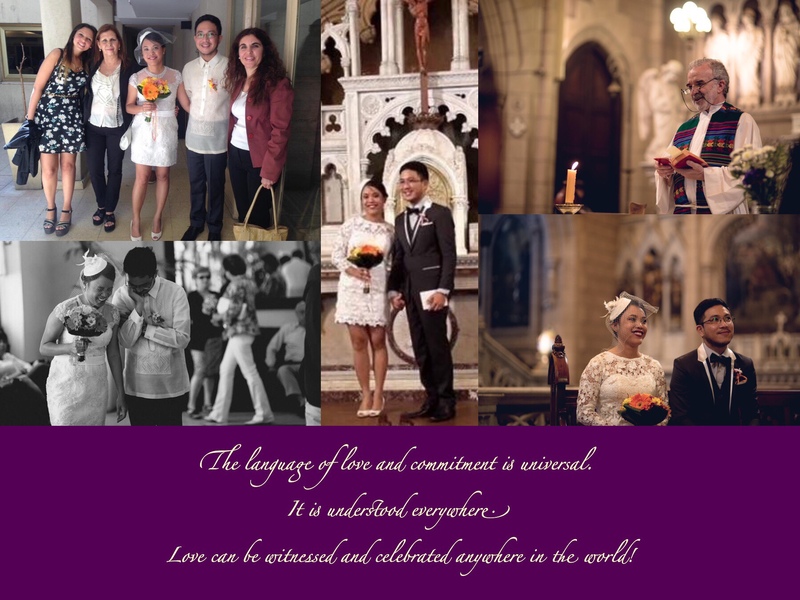 Others advised us to get married civilly in the Philippines first to ensure the validity of our marriage so that our wedding abroad would mainly be ceremonial. 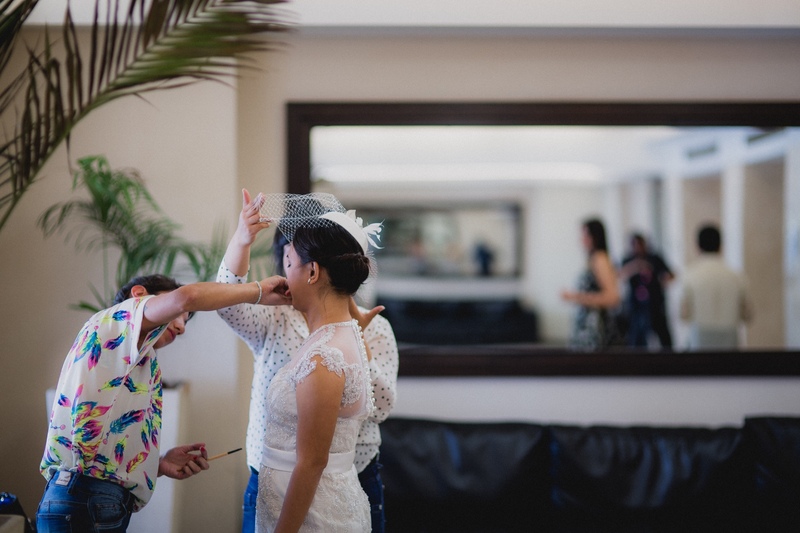 However, we wanted the full experience of truly getting married abroad, experiencing an age old tradition – getting married – in a different setting, a different culture – and we were up to the challenge of finding the right place for us where it would be possible. 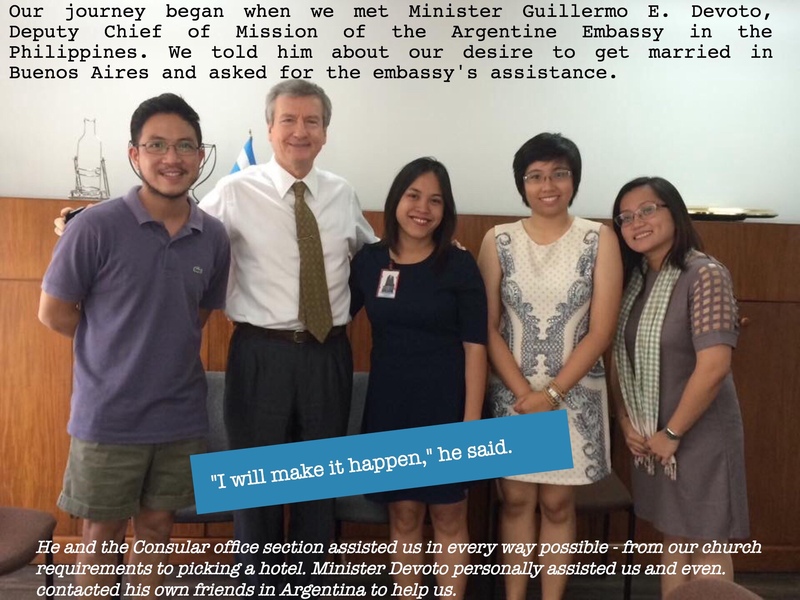 Armed with our crazy idea, we began corresponding with the Embassy of Argentina in the Philippines to ask for information and assistance. This is where we met Deputy Chief of Mission, Minister Guillermo Devoto, who interviewed us for our visa application. Moved by our earnestness and our highly unusual request, he pledged to help us in every way to make the wedding possible. 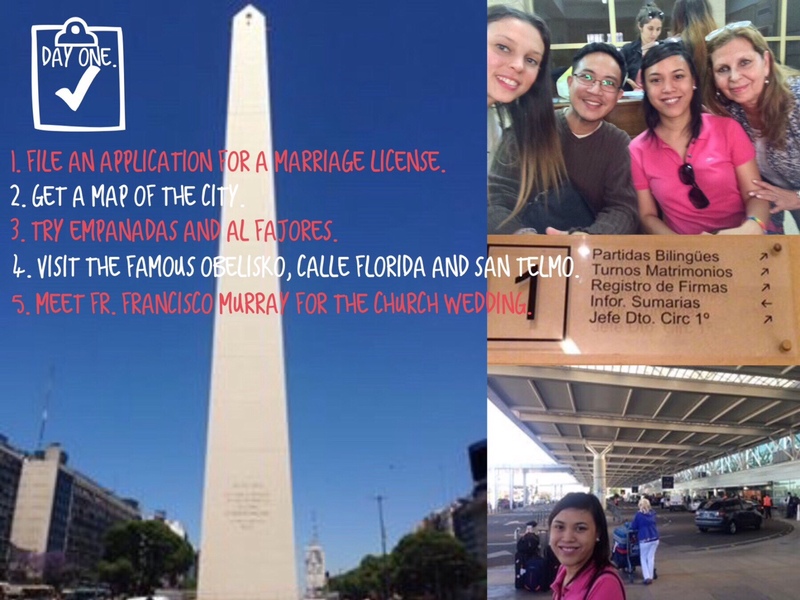 Because we wanted both a civil and church wedding in Buenos Aires, it meant a fair amount of paperwork for the church wedding. 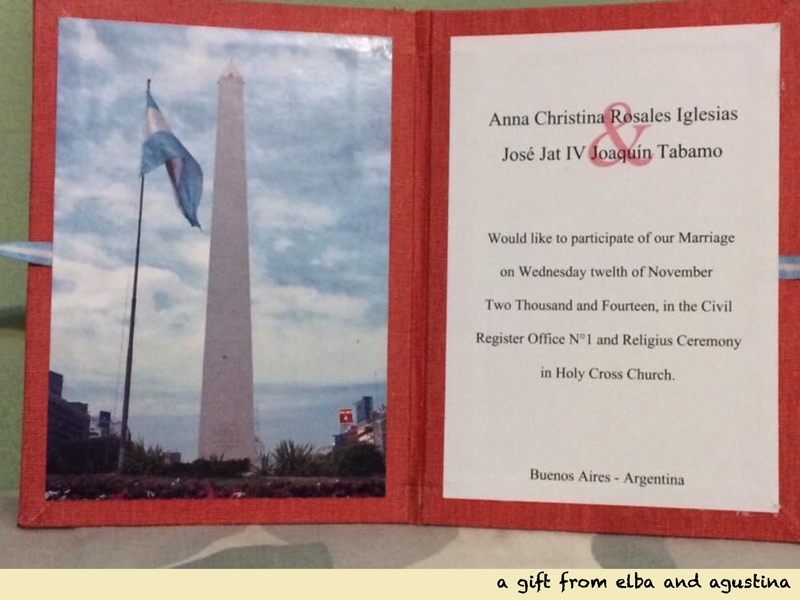 We had to get our baptismal certificates and pre-wedding seminar authenticated by the DFA and legalized by the Embassy of Argentina, and we even needed special permission from the Diocese of Tarlac (on top of special affidavits from witnesses to attest we had never been married before) to transfer the church wedding to Buenos Aires, Argentina. Waiting for us halfway across the world in Buenos Aires was the amazing mother and daughter tandem of Elba Cubilla and her daughter, Agustina. 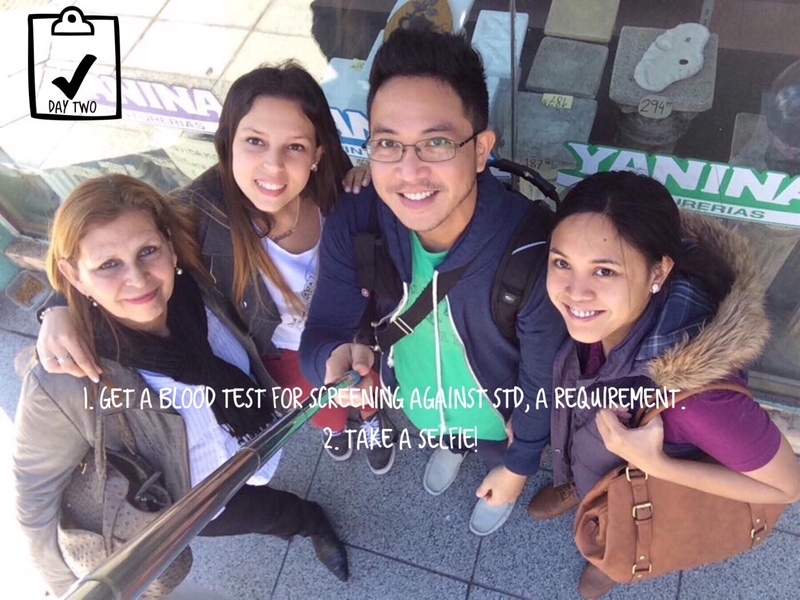 The lovely Elba, a longtime friend of Minister Devoto, was requested by Minister Devoto to help us. Elba, who works at the Defensoria del Turista, an institution dedicated to assisting tourists with their problems, knew the ins and outs of the city and the different offices there. Pretty Agustina, who speaks English, was our interpreter and hip and young unofficial tour guide while we navigated Buenos Aires. Aside from going with us to prepare our papers, they looked for an interpreter (for the civil wedding), suppliers for the video coverage, my flowers and hair and make up. 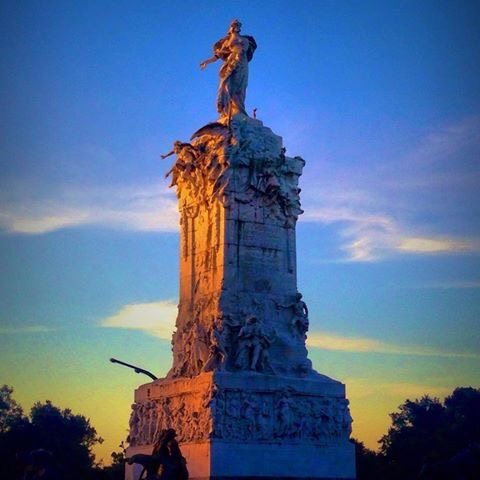 The idea of getting married in Buenos Aires was both nerve wracking and exhilarating, because the sheer uncertainty of the situation was balanced by the thrill of being in such a beautiful city. 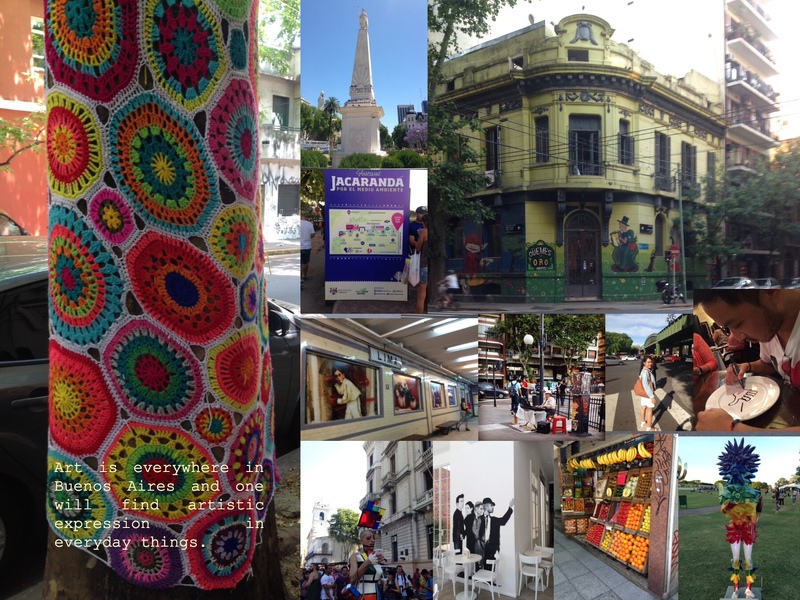 In our first day alone, we had seen many of the popular tourist destinations we read about – Calle Florida, San Telmo, … . 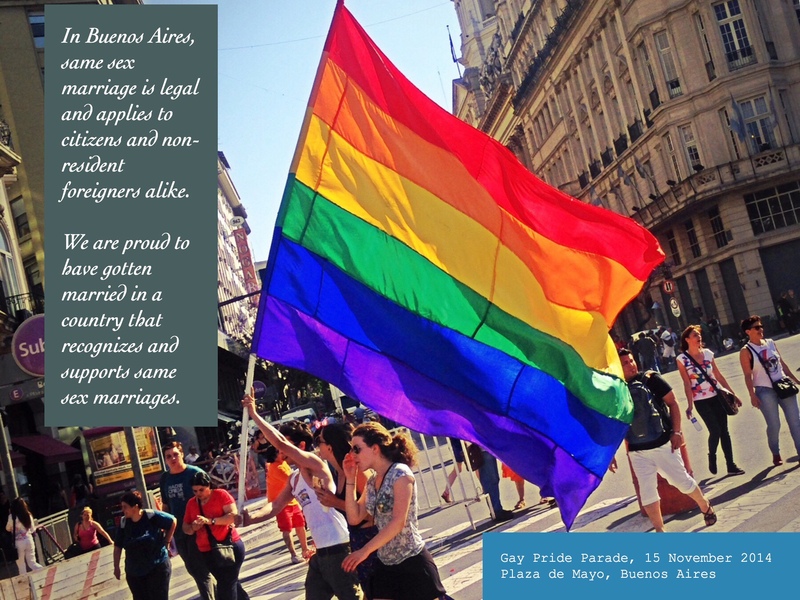 We even encountered a rally en route to Plaza de Mayo. Not being able to speak Spanish made it difficult to ask around and understand the simplest of explanations but with Agustina and Elba around, we were able to avoid getting caught up in long lines and people went out of their way to help us. Our first day was really crazy and hectic but we covered most of the requirements we needed to produce, and the government guy just told us to come back. In between working on our papers, we explored the city and hunted for good places to eat. 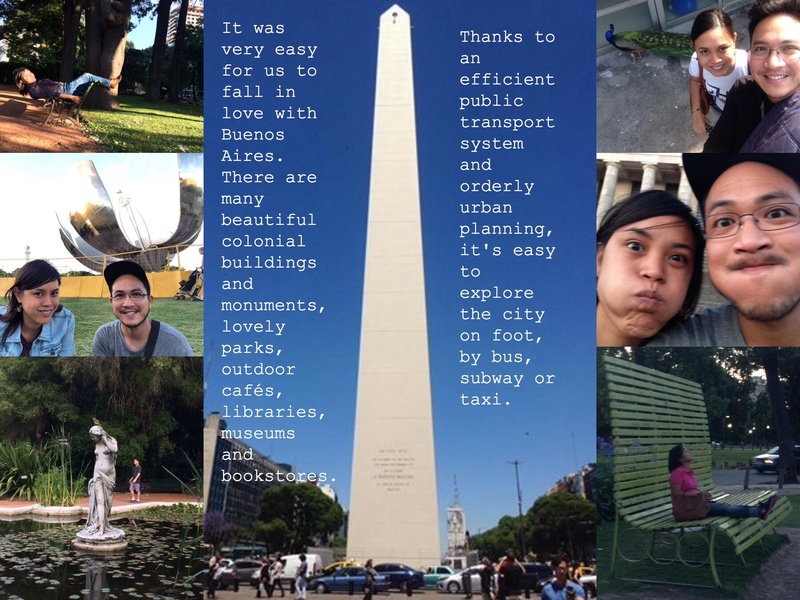 We fell in love with the quaint, old world feel of Buenos Aires – its large colonial buildings, big, expansive parks where it is so nice to sit down and enjoy the sunshine, the little fruit stalls and and outdoor cafes. Of course, we had the world famous Argentine steak almost immediately upon arrival, first at Don Julio’s near where we stayed in Palermo and twice at La Cabrera also in the Palermo area. We were surprised to find a lot of sushi places and we tried the most famous (and expensive, I surmise) of them all, Osaka. (Overpriced and overrated, but a nice cozy place nonetheless) Aside from the steak, we also tried other local fare of medialuna (sweet croissant), dulce de leche (sweet milk jam), empanada (meat pies) and alfajores (chocolate wafers). 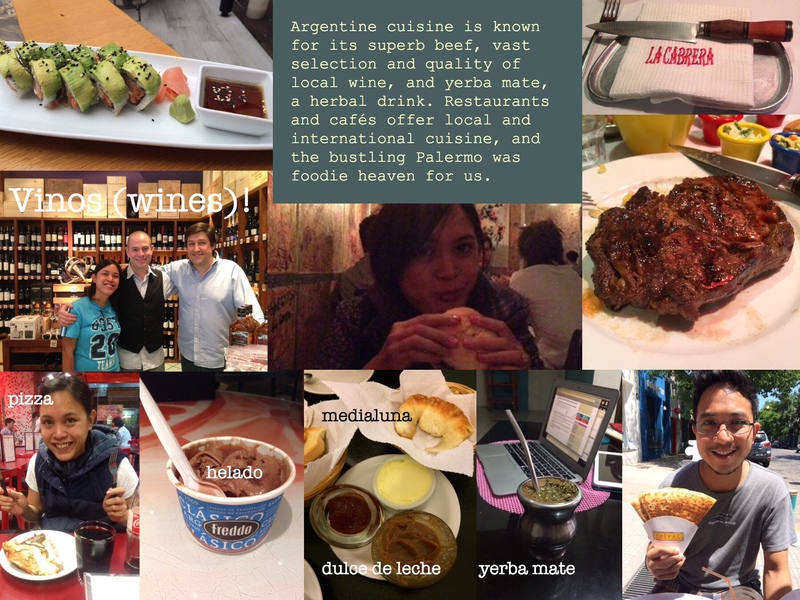 Most of the food we ate in Buenos Aires was sweeter and richer than what we are accustomed to, but surprisingly we did not gain weight at all. In fact, we even lost weight just in time for our wedding largely because we enjoyed walking around and exploring the city. It was springtime when we arrived, with the breeze nice and cool enough for walking. Two days before the wedding, however, we hit a major snag. The government guy who initially looked at our papers downplayed one very critical requirement – and only remembered to bring it up when we returned with the rest of our papers. All of a sudden, he set an impossible deadline of ONE HOUR to look for a notary public to prepare a document stating that we have established temporary residence, etc. Even more ridiculous was the fact that after we talked to a lawyer, apparently, the lawyer was duty bound to go to our hotel to verify the facts first before drafting the document. Fortunately, Elba found someone higher up to explain and waive the ONE HOUR deadline, giving us one more day to finalize that requirement. Finally, the day before the wedding, we were able to take care of everything through Elba’s help and in the process we also got to know a wonderful lady lawyer named Dra. Ingrid Bergstrom, an Argentine notary public of Swedish and Spanish descent. Fortunately she spoke English making it easier for us to explain ourselves. She was also quite pleased to find out that she was talking to lawyers as well. 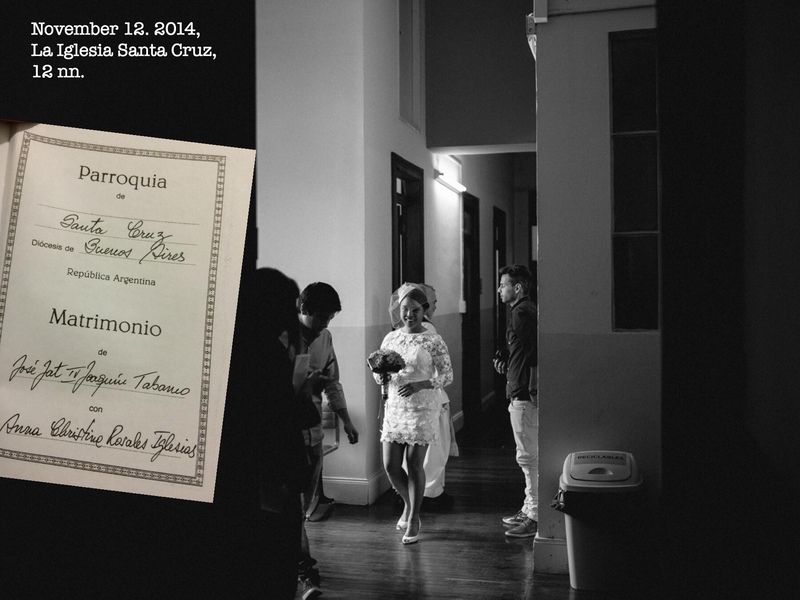 Thus, on November 12, a week after our arrival in Buenos Aires, we were set for our wedding in Registro Numero 1, Uruguay St. at approximately 10 am. On the big day itself, I woke up before 7 am to wait for my hair and make up girls, Jessica and Macarena of Peinados both of whom barely spoke English. It was both hilarious and challenging trying to figure out what make up look I had in mind, since I could barely speak Spanish and they couldn’t explain it to me in English. Despite the language barrier, and giving instructions pantomime style, they were able to work their hair and makeup magic on me. Our civil wedding, the first one scheduled for the day was entirely in Spanish, with Elba and Agustina our witnesses. 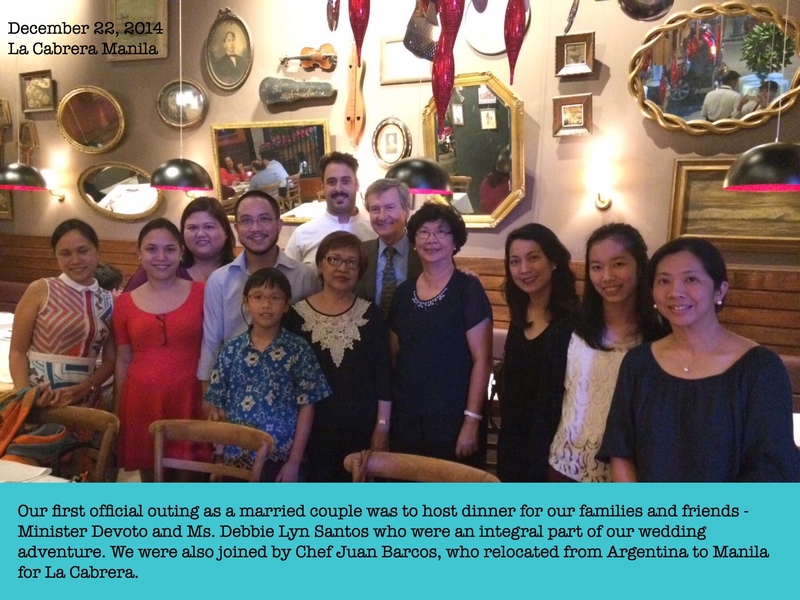 In accordance with Argentine (and Filipino) tradition, our civil wedding ended with a shower of rice grains from Elba and company. We then proceeded to the beautiful La Iglesia Santa Cruz, or what the locals call the “Irish church” for our church wedding. Fr. 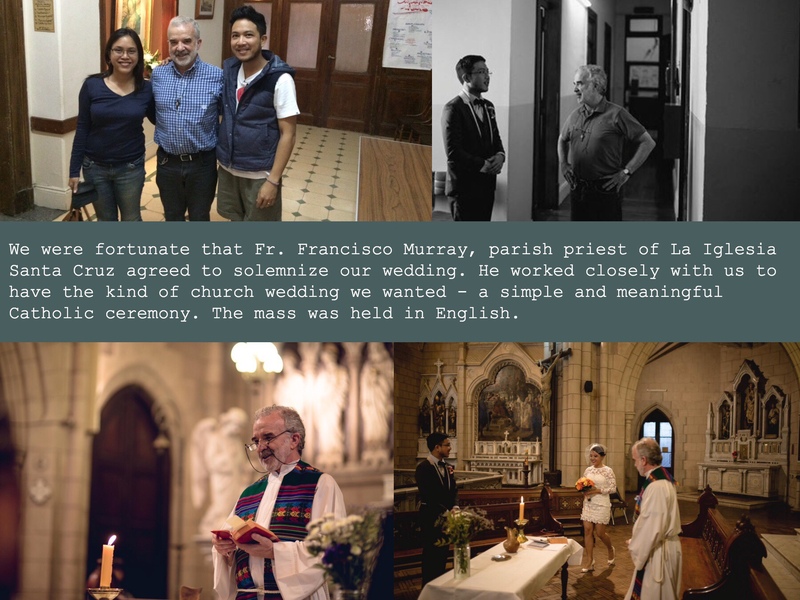 Francisco Murray, the parish priest of La Iglesia Santa Cruz, carries on the ministry of the church and worked closely with us in the days leading to the wedding in order for us to achieve the simple and meaningful ceremony we wanted. 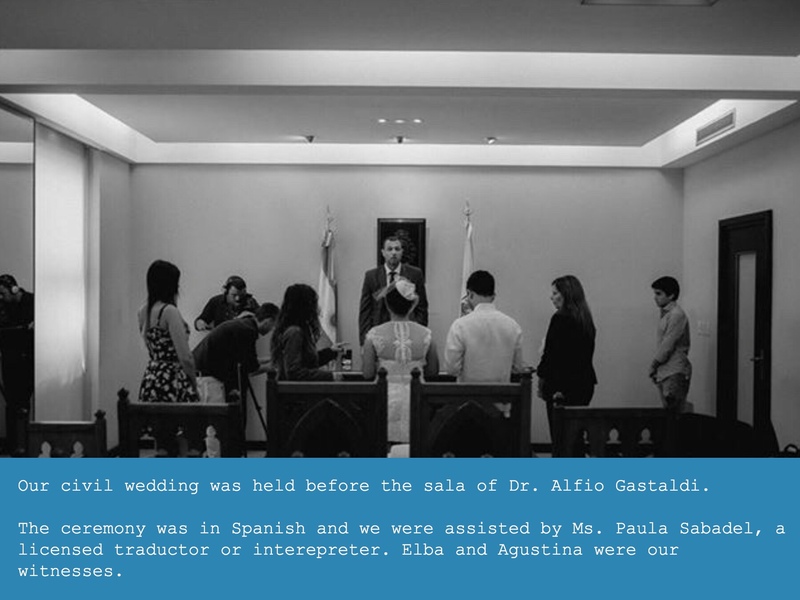 In the church ceremony, Elba and Agustina were again our instrumental witnesses, with Agustina even doing a reading from the Bible for our marriage rites. After the wedding, we celebrated with a simple lunch at a popular American style restaurant, Kansas, with Elba and Agustina. While we stayed mainly at Koten Hotel on Guemes St. in Palermo Soho throughout our stay, for our wedding preparations and wedding night, we chose the picturesque boutique hotel L’Hotel Palermo on Thames St. for some pampering. We chose the hotel upon the advice of our talented Israeli photographer Ariel Novak who also doubled as our unofficial tour guide for places to see and places to eat in the city. After the wedding, we chose to stay in Buenos Aires instead of going to Patagonia to see Perito Moreno or to the border between Argentina and Brazil where you can find Iguazu Falls since we had little over a week left to enjoy the city before our next stop to Chicago, in the United States. 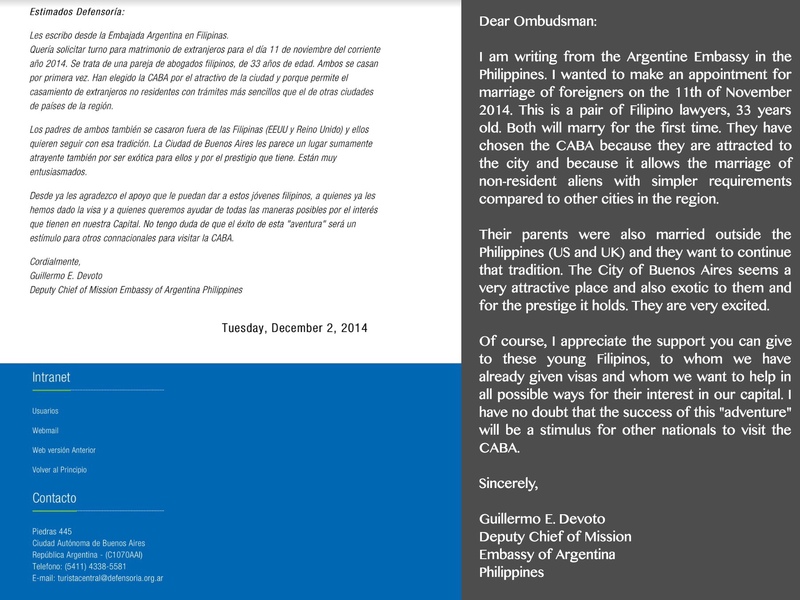 In the meantime, we made sure to report our marriage to the Philippine Embassy in Buenos Aires. 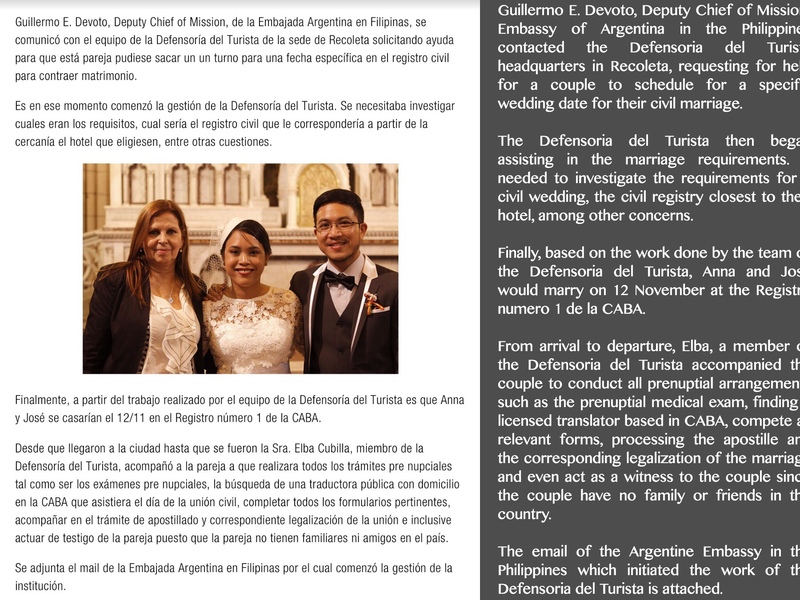 Filing our report of marriage was a different challenge altogether since we needed to have our marriage certificate legalized (apostillado, as they call it) and translated into English. Again, together with Elba and Agustina, we navigated the whole process with visits to the Argentine Ministry of Foreign Affairs (Cancilleria) and the Colegio de Traducto for our English translation. 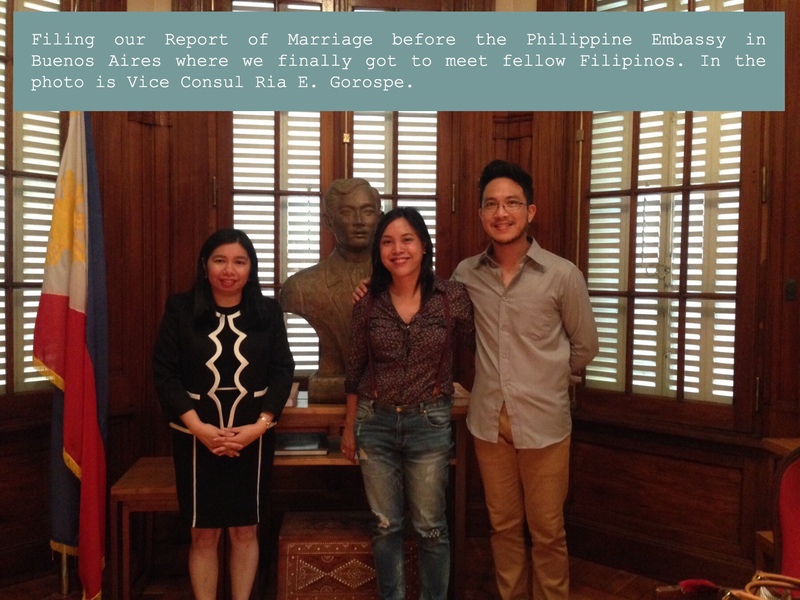 After having finished that part, we paid a visit to the Philippine Embassy to file our report and meet fellow Filipinos! We reluctantly bade Argentina goodbye, but not before having our farewell dinner with Elba and Agustina at La Cabrera, a popular tourist destination for some of the finest steak dinner in Argentina and possibly the whole world. 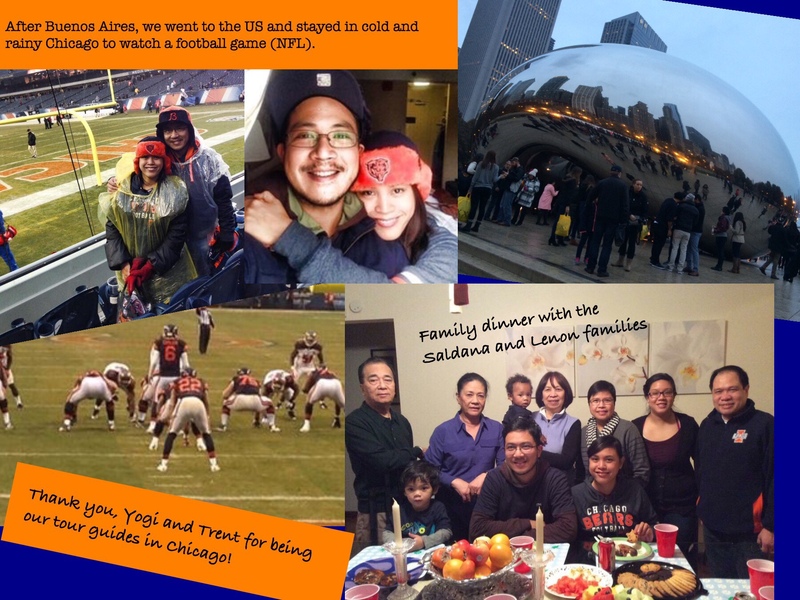 Our two weeks in Argentina went by so fast and soon we were on the plane to the United States to watch a football game in Chicago before going back to the Philippines. During our two day stay there, we met up with my husband’s relatives, the Saldana and Lenon families and Jat’s cousin Yogi took time off from her busy schedule to show us around. 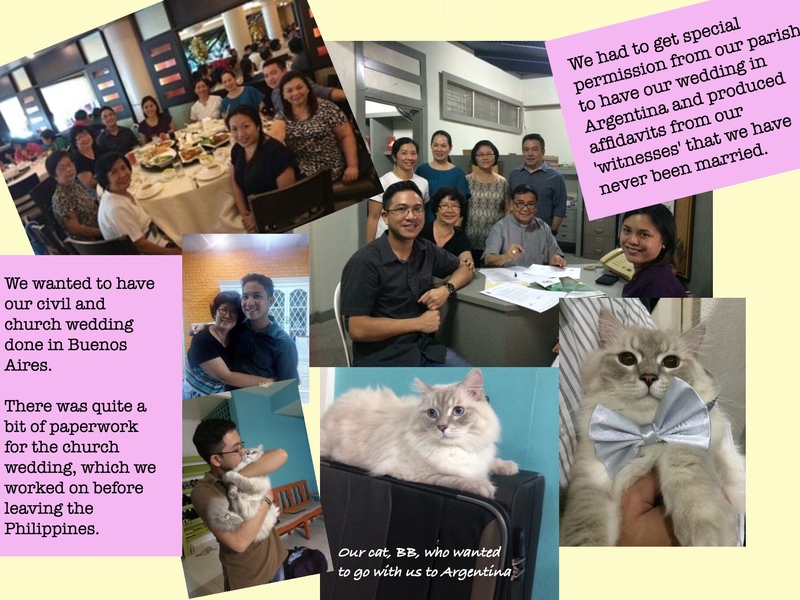 Our hearts got left behind in Argentina when we returned to the Philippines, but we do our best to relive our unforgettable and one of a kind wedding there and share our story with our families and friends over a communal sip of Yerba mate (a beloved herbal drink in Argentina), some world famous Argentine wine, a bite of alfajores pastry and some dulce de leche on white bread. Oh, but we still miss our daily medialuna (thick, sweet croissants) from Koten and we dearly miss our long walks around the beautiful city of Buenos Aires with its old world charm, and we long to hear the unique porteño Spanish we learned to speak (un poquito – just a little) eventually, along the way. We miss saying “hola, buen dia” to the kind and friendly locals who patiently listened to our broken and comical sounding attempts at speaking castellano, porteño style. 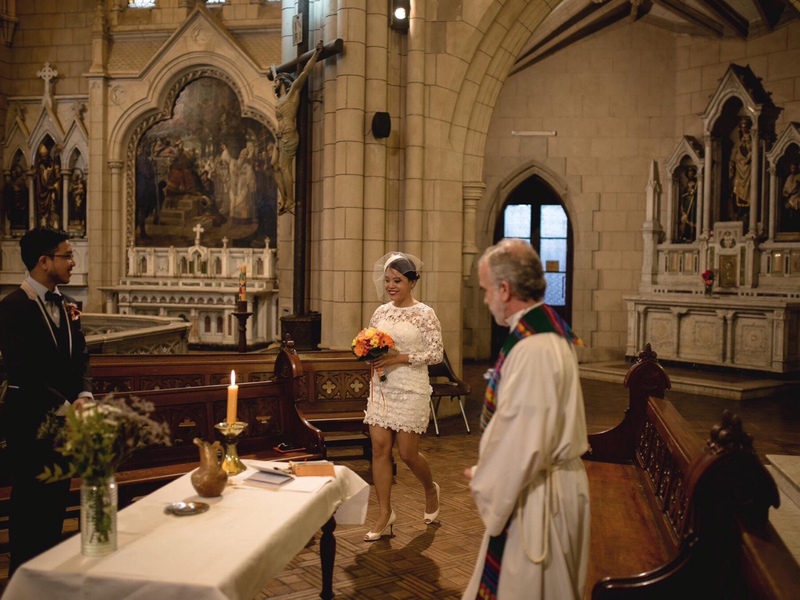 Upon learning the news that we got married overseas, loads of people were surprised that we chose to do our wedding this way. The idea is apparently still quite novel if you’re coming from a very traditional mindset, i.e. getting married in a faraway place without family and friends present, but we wanted something different for ours and sometimes, risks do pay off. We took a different path and boy, we had an amazing trip. 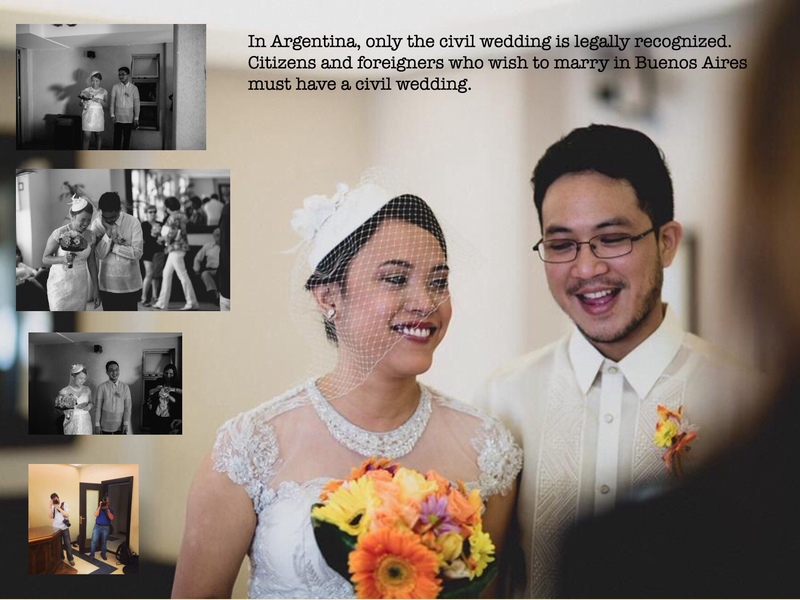 The best part is, our wedding didn’t cost as much as having a big, traditional wedding in the Philippines – yes, even if you include the airfare to Argentina and our US trip. Thanks to our families’ generosity and availability of really good people for the things we needed for our wedding, we even came home with savings for our future plans. We got to have the wedding we had in mind, and a honeymoon, too, in a beautiful city. 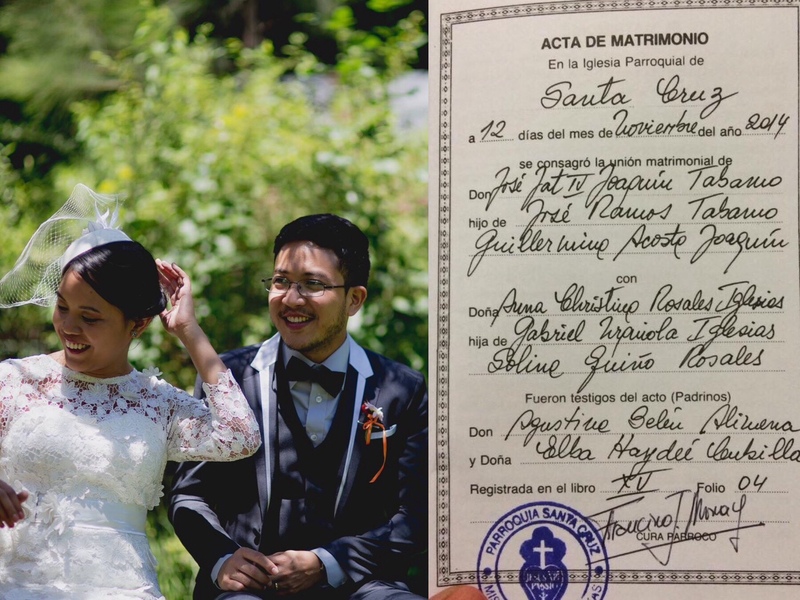 Our takeaway from our wedding experience in Buenos Aires, Argentina is that apparently, nothing is too crazy or impossible if you set your mind to it. We are all incurable romantics deep down, really, and cultural differences and language barrier aside, we all want crazy romantic ideas to have a happy ending. 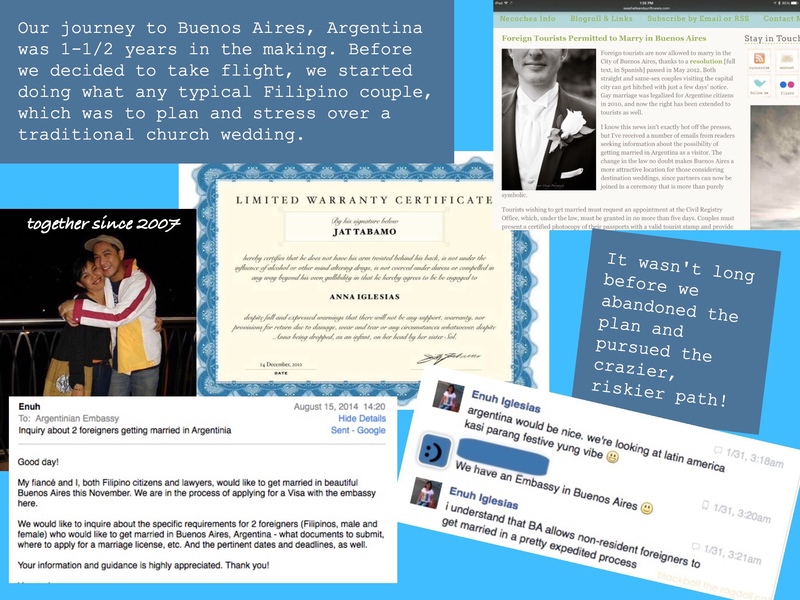 From our part of the world in the Philippines all the way to Argentina, there were wonderful people who made it possible for us because they wanted to help make our own story have a happy ending. “You have made a long way for this wedding and maybe this be a symbol of your life, your love… That your love will last a long way, too.” Father Murray said to us. We take his words to heart and feel that his words captured how we want our wedding to mean to our married life. We had the wedding we wanted without sacrificing it to what was expected, familiar or convenient. My advice to couples out there who are thinking of doing something different, too, don’t ignore your potentially crazy ideas. You just take that fragile idea and will it into existence. Challenges, adversity can and will be overcome if you work together as a team and have faith. Love, that great and mysterious force of nature, will sweep you off your feet and take you on a great big adventure. 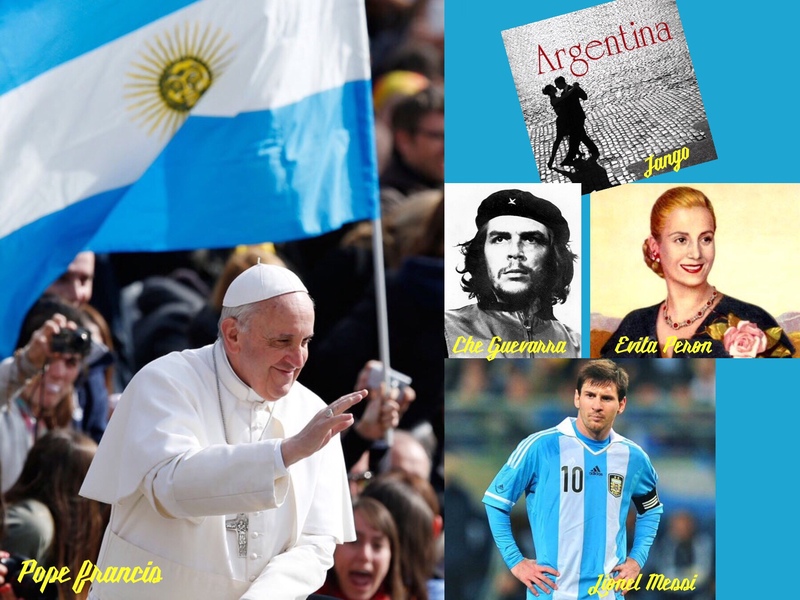 Maybe you’ll find yourselves in Argentina, too! It all looks so beautiful and romantic..and great pictures, too…. Definitely write a book about it, mareh! 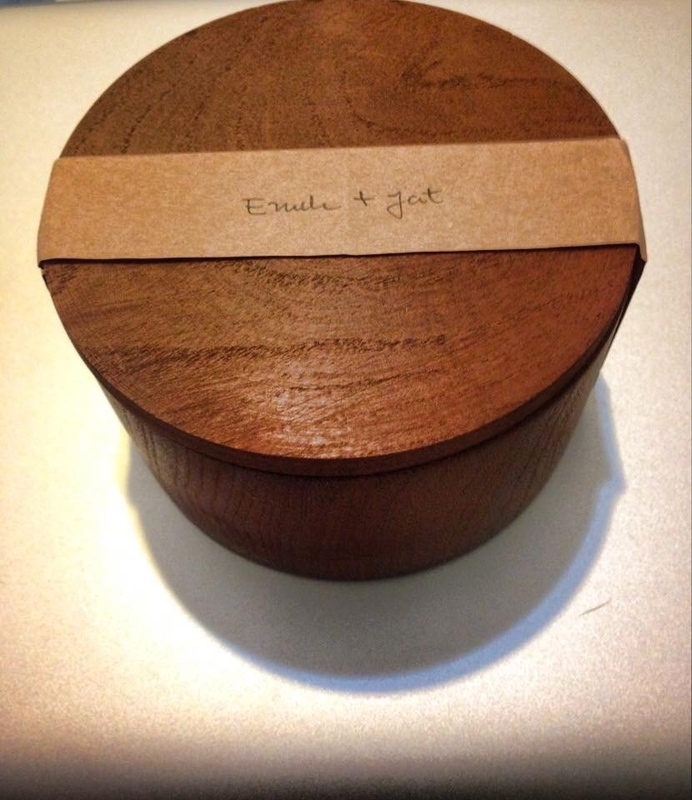 It’ll be a great memento of your two-week wedding adventure! great stuff enuh! definitely one of a kind! Because I have nowhere to put my reviews, which can be of all sorts of stuff. Check out my app review site: http://appsized.com if you love your iPhone, iPod Touch or iPad.